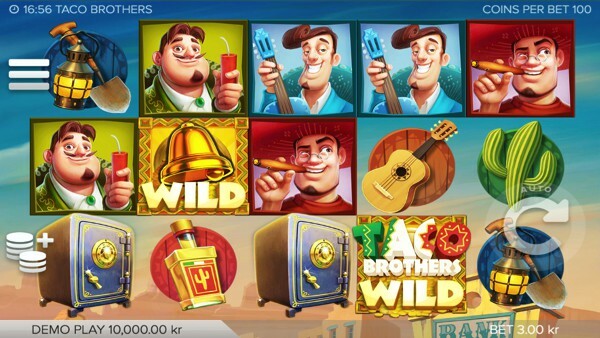 If you enjoy video slots that are fast passed, then get ready and prepare yourself for one of most exciting slots of your life in ELK Studio’s Taco Brothers, a slot with 5 reels and 243 ways to win. The choice is yours as you enter this world and play as either Paso, Pepe or Pico who are out to rob banks and find treasure. It has bonus features that include wild symbols, free spins, bonus multipliers, re-spins, running wilds and a top payout of 150,000 coins. The background displays a beautiful Mexican village during the peak hours of the day. Banks and old buildings resembling the old west have the beating sun hitting them always. You will find that canyons surround this village, giving this game a beautiful backdrop. Each of the symbols have a cartoon finish, and the reels are completely transparent. The highest valued symbols are Paso, Pepe, and Pico. Paso is dressed in a red sombrero and poncho while smoking a cigar. Pepe is dressed in a blue shirt with a guitar and Pico is wearing a green shirt with a piece of dynamite in his hand. The other icons include a safe, golden bell, guitar, cactus, liquor bottle, shovel, and game logo. The collection of symbols gives the backdrop a wonderful finish. There are four different ways to bet in this game. The first is the total bet, which can cost anywhere from $0.10 to $50.00. Then there are betting strategies including Jumper, Leveller, and Booster. Jumper raises the bet level by one after each winning round until the four levels above the base bet is completed, it resets after a loss. Leveller raises bets by two levels after five consecutive losses, it resets when a win is awarded. Booster raises bet levels by one after a loss until four levels above the base bet are completed, this strategy resets once a win is awarded. The golden bell represents the wild substitute in Taco Brothers. When located on the reels it will replace each symbol except for the safe and secondary wild. The taco brothers game logo acts as the secondary wild, and two of these symbols present allows for wild symbols to remain in place and a re-spin occurs. This process can be repeated if three safe symbols are seen during the re-spin. The Wild Escape Bonus Game is activated when three safe symbols are concurrently seen on the reels. Here you will be given a random number of free spins, during which the brothers can drop on the 5th reel at any time and then move towards to the 1st reel. Whilst doing so, he will act as a wild and award any possible wins. Captain Diaz, when appearing, will send one of the brothers to jail and stop the running wilds until the next brother appears. This process repeats itself until all three brothers are in jail which will bring the feature to an end. In order for another brother to appear on the 5th reel, the Senorita must be seen on the reels. Taco Brothers is a fast-paced experience featuring high-quality graphics, consistent gameplay and outstanding bonus features. This slot is played at a medium volatility, so prizes are won frequently but aren’t of substantial value. This proves to benefit users with prizes being consistently awarded, effecting player balances in the positive. Overall, this game gives users something to remember and enjoy.